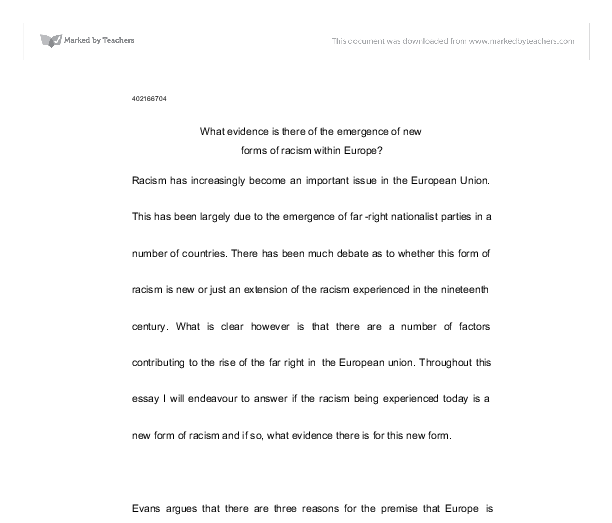 402166704 What evidence is there of the emergence of new forms of racism within Europe? Racism has increasingly become an important issue in the European Union. This has been largely due to the emergence of far-right nationalist parties in a number of countries. There has been much debate as to whether this form of racism is new or just an extension of the racism experienced in the nineteenth century. What is clear however is that there are a number of factors contributing to the rise of the far right in the European union. Throughout this essay I will endeavour to answer if the racism being experienced today is a new form of racism and if so, what evidence there is for this new form. Evans argues that there are three reasons for the premise that Europe is experiencing a new form of racism. 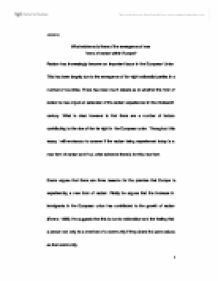 Firstly he argues that the increase in immigrants in the European union has contributed to the growth of racism (Evens; 1996). He suggests that this is due to nationalism and the feeling that a person can only be a member of a community if they share the same values as that community. With the success of the far right in Germany, France and Italy, the issue of immigration within contempory political discourse has raised questions about the rights of citizenship, the nature of nationality and the viability of a multicultural society across the European union. ...read more. Italy National alliance Northern League 16% 10% 1996 Norway Progress Party 15% 1997 Switzerland Swiss People's Party 23% 1999 This is clear evidence that the far right has been able to influence voters across Europe and bring issues such as immigration into the mainstream political agenda. Harris believes that success at the ballot box is dependent on a number of factors, such as the absence of an attractive alternative for the right wing and external circumstances of economic or political crises (Harris; 1994). The voters have not only been those of the centre right but also from the left, evidence of this came when Le Pen beat socialist Prime Minister Lional Jospin in the first round of the presidential elections of 2002. Anthias sights the demise of socialism, the failure of identity politics, the right wing backlash to policy and government initiatives and the fragmentation of social forces (Anthias; 1992) for the increase of votes to the far right. The far right instigated immigration debate with the help of increased media coverage, particularly in the newspapers, which has reported the increase of asylum seekers less then favourably (Evans). Far-right parties tend to be 'single- issue' and use the increase in immigration as a springboard for other issues such as the economy, law and order and welfare. The new form of racism is suggested to have formed in Britain in the period of the new right in the 1980's; this is because of the particular emphasis new right ideology had on national identity. ...read more. European Union member states have recognised the persecution of the Roma with 7,000 being granted refugee status between 1990 and 1999. However it still remains a "major problem" amongst the future states of the European Union. As well as the Roma racism within Europe there still remains anti-Semitism, particularly in within the eastern bloc. Although the new anti-Semitism has a lot in common with that of the past (the anti-Semitism of Nazi Germany) it now consists because of new historical events. Since 1989 anti-Semitism has spawned due to the snail like pace of the economies of the former communist countries. Due to the economies of these countries not flourishing the Jews have been blamed (Evens; 1996). This is further evidence of a new form of racism as it has spawned on new historical events and proves that racism, as a phenomenon is not static. In conclusion there is clear evidence that there is new form of racism across Europe that has a clear focus on nationality and the protection of national borders. It is also clear that this new form of racism could have been produced in conjunction with the European Union. As I have explained racism is not a static phenomenon and has move historically which makes it harder to control as current events create racial fear and hatred, such as that of Islamaphobia through terrorism. The major factor for this new racism has been the increase in immigrants into Europe. However the new form of racism that the Europe is experiencing can be closely linked to the traditional racism. ...read more. As a result of this pursuit of salvation there was a huge psychological effect which bought with it a deep sense of sin. When people experienced this type of guilt they naturally sought to relieve it in any way possible, and one of the methods frequently used was to transfer it to another person 9. The technological progress and higher interest rates in the 1980's led to the restructuring of the labour market with growing unemployment and increasing demand for a qualified labour force. The limits of the welfare states become more and more obvious. Typically they desired a more spiritual life, a community in which to live cooperatively; they wanted to become enlightened, to find meaning in serving others, or simply to belong" (Deikman 4). In fact, some of the strongest and largest cults are the "church" of Scientology, the followers of deceased philosopher L.
Conservatives believe that the human is fundamentally flawed. As man is imperfect we have no chance of creating a perfect society and attempts to do so are completely pointless. 7. Freedom and property are closely linked. It provides a sound economic basis and it allows large civilizations to be created. the Cyprus dispute stands as a precondition for both Turkey's and Cyprus' accession to the Union. The Commission report recommends that once the eventual resolution of the dispute is reached, it would be much more easier for the island to become a member country.